Hop into a state-of-the-art Polaris ATV and speed over dirt and gravel tracks on a 4.5-km long jungle circuit. On this half-day trip, you'll travel into the wooded highlands of Bali, away from the coast and urban noise, for an hour of fun on a specially designed jungle circuit. For complete safety, you'll have an extensive briefing with a test ride before you can go zipping down the track. Here, you can drive at your own speed and comfort and enjoy the gorgeous greenery surrounding the track for upto 3 laps on the circuit. After the laps, you can have a delicious lunch and spend time in a swimming pool before calling it a day. Zoom past views of a dense forest on this custom-designed jungle circuit with dirt and gravel tracks. You'll be driving single or double-seater Polaris ATVs that are equipped with a 325cc engine for a smooth ride over off-beat tracks. For safety, the vehicles come equipped with seatbelts and safety nets. You'll also be given a safety helmet. • Explore views of a dense forest on a custom jungle track. • Take 3 laps on a ATV at your own speed. • Feel the thrill of zipping down dirt tracks in a jungle buggy. For cancellations made more than 2 days before scheduled date of the Bali ATV Jungle Buggy trip: 90% refund. For cancellations made 2 days or less before scheduled date of the Bali ATV Jungle Buggy trip: no refund. All travellers are required to be older than 18 years of age and carry a valid driver's license in order to book this trip. Travellers between the ages of 12-18 years can also book this trip but will only be able to participate as a tandem passenger in the ATV Jungle Buggy. Bookings for tandem passengers are charged at a discounted price of INR 4,100 per person. 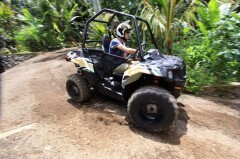 ATV rides in Bali take place twice a day during the morning session and afternoon session. Pick-up and drop-off timings vary according to your selected session. Timings are approximate and subject to delays. For the morning session, you'll be picked-up from your hotel in Bali by 7:30-8:00 hrs from Nusa Dua, 7:30-8:00 hrs from Kuta/Seminyak, 8:00-8:30 hrs from Sanur and 8:15-8:45 hrs from Ubud. For the afternoon session, you'll be picked-up from your hotel in Bali by 12:00-12:30 hrs from Nusa Dua, 12:00-12:30 hrs from Kuta/Seminyak, 12:30-13:00 hrs from Sanur and 13:30-14:00 hrs from Ubud. 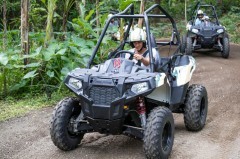 Take a Jungle Buggy ATV ride in Bali! You'll be picked-up from your hotel or place of accommodation in a private vehicle. A short drive later, you'll reach the Koko Bambu Restaurant in Tatag, where you'll gear up for the ride with a safety briefing and test drive. Soon, you'll be zipping down the jungle circuit on your state-of-the-art Polaris ATV. The 4.5-km off-road circuit allows you to do 3 laps over the dirt and gravel track at your own speed and ability. After an hour of fun on the circuit, you can change your clothes and have a delicious lunch at the restaurant. You'll be dropped-off at your hotel. For the morning session, you'll reach back by 15:00 hrs and for the afternoon session, you'll reach back by 20:00 hrs. Your trip ends here. Speed down tracks of dirt and gravel. All equipment required for the ATV ride: Polaris ATV, safety helmet etc. 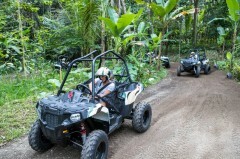 The ATV Jungle Buggy ride takes place in two sessions every day. Pick-ups begin by 07:30 hrs for the morning session and 12:00 hrs for the afternoon session. Today's meal package includes lunch at the Koko Bambu Restaurant. You'll also have access to the restaurant's swimming pool, so make sure to pack some swim-wear. 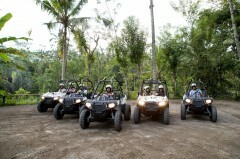 The tour operator will arrange your transport to the start point of the Bali ATV Jungle Buggy trip.